A Canadian doctor who captured a deadly encounter between a red fox and an Arctic fox in the wilds of Northern Manitoba has been named Wildlife Photographer of the Year for 2015. Don Gutoski, an accident and emergency physician from London, Ont., and amateur photographer, was named winner of the annual international competition developed and produced by the Natural History Museum in London, U.K., Tuesday evening. His photo beat out 42,000 other entries from 96 countries. Gutoski shot the striking image A Tale of Two Foxes in Wapusk National Park at Cape Churchill, Man. It's an area where the ranges of red and Arctic foxes overlap, as red foxes expand north with climate change. Gutoski spotted a red fox hunting and eventually realized its prey was an Arctic fox. By the time he got close enough to photograph them, the red fox had killed its prey and was feeding on it. Gutoski watched and photographed the scene for three hours in -30 C temperatures until the red fox picked up the remains of the carcass to find a place to hide it for later. Kathy Moran, a member of the jury for the contest, called it "one of the strongest single storytelling photographs I have ever seen." Moran, senior editor for natural history projects at National Geographic, added in a statement, "The immediate impact of this photograph is that it appears as if the red fox is slipping out of its winter coat. What might simply be a straightforward interaction between predator and prey struck the jury as a stark example of climate change, with red foxes encroaching on Arctic fox territory." According to the official caption for the image, red foxes now represent not just the main competitor for Arctic foxes for small prey such as lemmings, but also their main predator. After receiving the award, Gutoski told the Natural History Museum he was "more than overwhelmed." "This to me has always been the epitome of my hobby and professional photography and to win it all is just beyond my imagination right now." A photograph of two ruffs fighting by 14-year-old Czech photographer Ondrej Pelanek won the Young Wildlife Photographer of the Year title for 2015. Winners and finalists were also announced in 16 other categories. 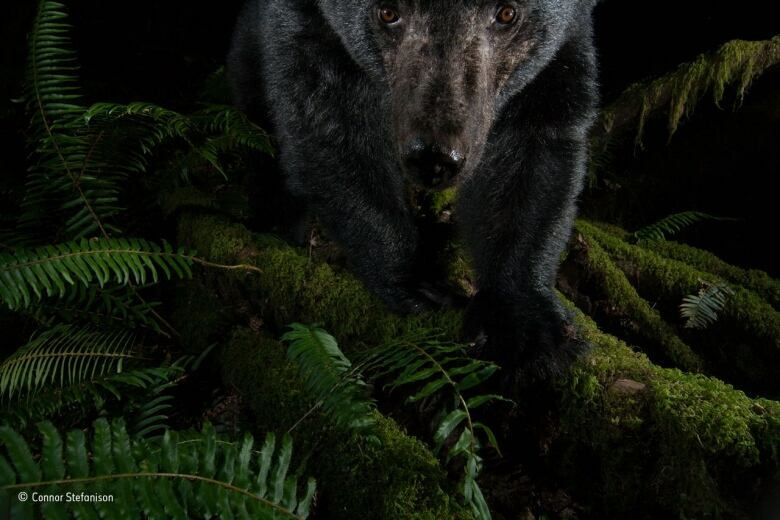 Canadian Connor Stefanison of Burnaby, B.C., won the Rising Star Portfolio Award for the second time, following a previous win in 2013, with a series of six haunting photos featuring a black bear, mountain goats, and other subjects in dramatic lighting. Ten-year-old Josiah Launstein, who belongs to a family of photographers near Pincher Creek, Alta., was a two-time finalist in the 10 and Under category, with his photos Goose Attack and Snowy Snowy, featuring a snowy owl hunting in a snowstorm. The images will go on display at the Natural History Museum on Oct. 16, and will be coming to Canada later in the year. The exhibit opens at the Royal Ontario Museum in Toronto on Nov. 21.